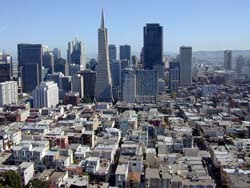 The presented room availability, rates and discounts are actual and final for all our 237 hotels in San Francisco. Many tourists identify this buzzing and multi-faceted tourist destination with freedom of every aspect of life. The city of San Francisco is exactly the place of holding of the largest and most significant gay pride march in the world as well as plenty of other the same shocking and outrageous events of the kind. Among cultural events tourists will find rather attractive holidays and celebrations which will be of great interest to visit for all city guests without exception. One of the most waited events as among local residents so among city guests is the San Francisco Streetfood Fest which is commonly held annually in the second part of August. The food festival engages the most famous cooks and chefs. Each year the event attracts dozens of thousands of tourists from all over the world. It should be noted that the festival does not resemble any other restaurant fests held in other cities of the country. Food stalls offering various treats to meet every taste and fancy are installed right in the streets and city parks. City guests have a chance to enjoy various ethnic foods as traditional hamburgers and cheeseburgers, traditional Italian pizza and Japanese cuisine treats. The festival offers a really great choice of treats and dishes.